The United Nations has convened a new round of indirect Syrian peace talks in Geneva, despite President Bashar al-Assad dismissing them as irrelevant. The government and opposition have agreed to discuss four "baskets" - a political transition, new constitution, elections and combating terrorism. Mr Assad has said "nothing substantial" will come out of the talks. 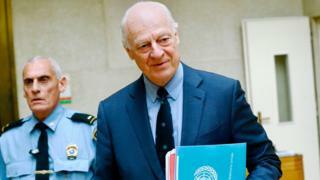 But UN envoy Staffan de Mistura insists that the government's 18-strong delegation is in Switzerland "to work". Five previous rounds of negotiations have made little progress towards a political solution to the six-year civil war, which has left more than 300,000 people dead. Mr de Mistura met the government's chief representative, Bashar al-Jaafari, at UN headquarters on Tuesday morning as the sixth round of talks got under way. Later, the UN envoy will see Nasr al-Hariri and Mohammad Sabra of the main umbrella group representing political and armed opposition factions, the High Negotiations Committee (HNC). Meanwhile, officials from the Syrian government denied accusations that a prison crematorium was being used to hide mass killings of political prisoners. In a statement carried by the Syrian Arab News Agency (Sana), the country's foreign ministry said the accusations - made on Monday by the US state department - were "a new Hollywood story" and "totally baseless". An anonymous source quoted in the statement accused the US government of making the allegations up to justify US aggression in Syria. On Monday, Mr de Mistura told reporters the intention was to be "more businesslike, both in our meetings and in the way we hope we can get some progress". The rooms would be small, the meetings would be more interactive and frequent, and discussions would be focused on particular subjects in an effort to achieve "more movement", he said. He also played down last week's dismissive comments by Syria's president, who said the Geneva talks were "merely a meeting for the media" and praised the parallel process taking place in Kazakhstan's capital that has been organised by the government's allies Russia and Iran, along with key opposition backer Turkey. The Astana process resulted in the three powers signing a memorandum on 4 May establishing four "de-escalation" zones in the north-western province of Idlib, north of the central city of Homs, the Eastern Ghouta area outside Damascus, and in the southern provinces of Deraa and Quneitra. "We are working in tandem, in a way," Mr de Mistura said. "Everybody's been telling us and we agree that any type of reduction of violence, in this case de-escalation, cannot be sustained unless there is a political horizon in one direction or the other. That is exactly what we are pushing for," he added.